I am always attracted to recipes that use unusual ingredients. When I saw what was in the sauce for this recipe, I knew I would be making it. 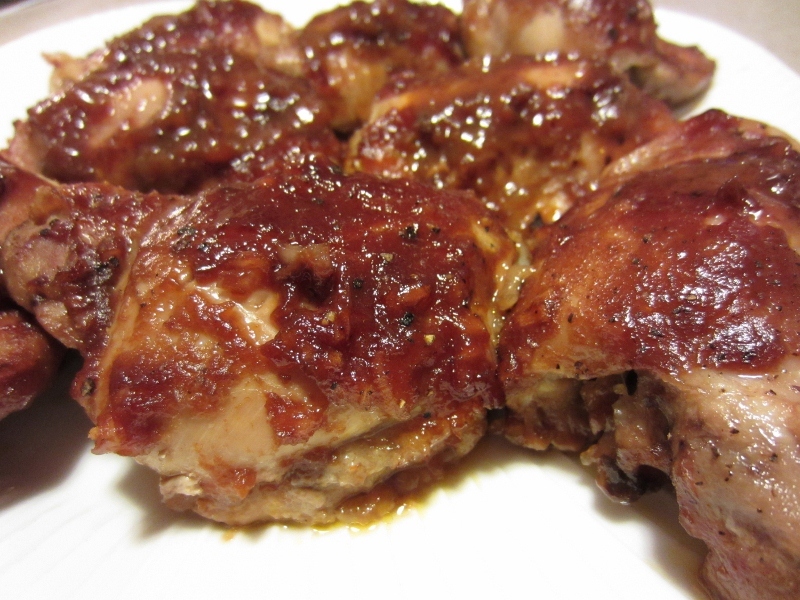 It's a very simple recipe using bone-in, skinless chicken thighs, which are quick becoming a favorite of mine. They are relatively inexpensive and they stay moist and tender no matter what you do to them. If you haven't come over to "the dark meat side" yet, bone-in, skinless chicken breasts would work beautifully in this recipe as well. The sauce is where this recipe gets interesting. A delicious combination of grape jelly and ketchup make the base of the sauce. Remember that old recipe using similar ingredients to make those yummy appetizer cocktail meatballs/wieners that was all the rage years ago? It's found a new life here! A bit of dry mustard, apple cider vinegar, some garlic powder and minced onion make the sauce complete. Add a little horseradish for some heat and you've got an easy and tasty sauce that bakes up all gooey in the oven. This chicken got two thumbs up from the peanut gallery. A keeper for sure. 1. Preheat oven to 400 degrees F. Spray a 9" x 13" baking dish with cooking spray. Arrange chicken thighs in dish. Season with salt and pepper. 2. In a small saucepan, heat jelly, ketchup, onion, vinegar, mustard, garlic powder and horseradish (if using) until the jelly is melted and the mixture begins to boil. 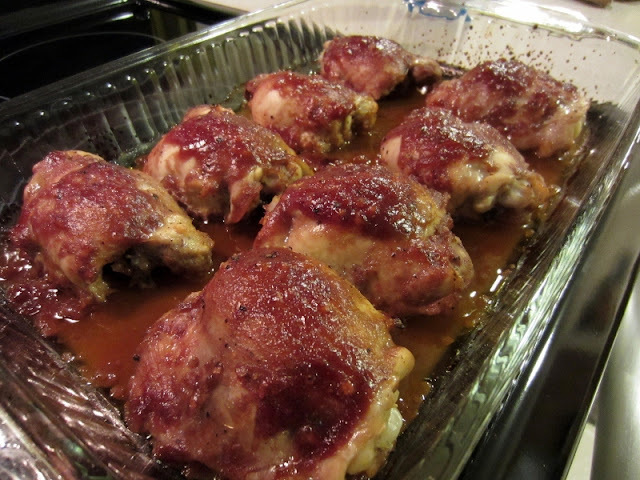 Pour sauce over chicken thighs and bake, uncovered for about 45 minutes or until chicken is cooked through and is tender. Quick, easy and such few ingredients. Totally reminded me of those cocktail weinnies of my youth! I'm probably really dating myself here, but does anyone else remember those meatball and weinny appetizers with the grape jelly/chili sauce sauce? The chicken gets so gooey and finger-licking in the oven. I will be making these again. You could certainly opt to eat only one thigh, slashing the PP value in half. That is, if you can stop at just one! For more gooey chicken goodness...check out Sticky Orange Chicken from A New York Foodie! I'm a big fan of chicken thighs! This sounds so good, I have to bookmark this one too. Funny thing is the recipe I picked from the Looneyspoons cookbook is the Nutcrocker (page 152) and features chicken thighs :) I can't wait to try both now! Oh, yummy! I have a similar recipe, but it doesn't have grape jelly in it. I'll have to try it. I love the combinations, it's a beautiful recipe ! Oh my goodness I do remember those cocktail wieners Renee! Too funny. Your updated recipe looks delicious and I bet it would be a hit with some of friends! I have been using boneless skinless thighs in a few recipes with good results. I just hate removing the little globs of fat from them prior to cooking! Yuck! Haha, I just made those cocktail wieners New Year's Eve! I've also made ribs with a sauce very similar to this and it was SO good! Can't believe I forgot all abt it. I'm a big fan of chicken thighs, too. They just always seem to turn out moist! This sauce looks delicious.